9:40 AM tet – due to typhoon Ondoy, we were stranded in City of San Fernando, Pampanga.. It was a horrible disaster we’d experienced. It killed so many lives. 10:04 AM tin – floodwater on the main ave. of greenwoods, pasig has not yet subsided since saturday. 9:47 AM Abi – Frustrating. As i was in Bangkok when I learned about it. I was getting an hourly update from family that the water was rising so fast. 6 feet in our 1st floor in a couple of hours. I’m just glad my family’s safe. 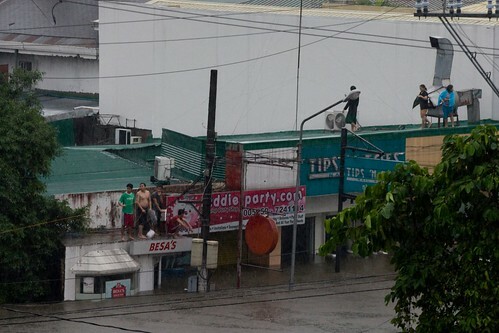 Residents and workers take refuge on rooftops as water rises at Barasoain and Wilson Street in Little Baguio in San Juan City. Located at a hilly part of the metro, residents and local offiicials were caught unprepared by the rising water in the area. Residents said that it was the first time they saw the creek overflowed that way. Early Saturday Greenpeace staff and volunteers in Manila, were deployed along with our inflatable boats to assist the Philippine National Red Cross in rescuing residents stranded on rooftops and taking care of the injured. Note: I was supposed to publish this yesterday but the power in our area went out and was not able to get back until this morning, but I was not able to get online due to the many things that needs to be fixed and cleaned here at home. What’s written in this account is but a minor thing compared to the extent and degree of damage that was done by the floods in other places. People who’re willing to share their stories are more than welcomed to share theirs by commenting on this post with their personal account of the floods. This is our last day in Ancient Siam, which means the last day of the Chang(e) Caravan project, which also means the last day with the elephants (Noooooooo!! But that’s okay, we promise to visit them when we go back to Thailand in the future). The Chang(e) Caravan ended with a press conference. Dealing with the elephants means dealing with dirty jobs, but apparently this job is not a big deal for Didit Wicaksono, Solar Generation Coordinator for Greenpeace Southeast Asia – Indonesia and Albert Lozada, Solar Generation Coordinator for Greenpeace Southeast Asia – Philippines. The second day was a big day for the Chang(e) Caravan project. In the morning, we marched from the entrance of Ancient Siam to the ’Bench of Public Appeals’. Before the long march, a small ceremonial activity was done with one of the elephants, Tong Dang, along with his mahout, to pay respect to the holy figures located in the entrance of Ancient Siam.